In this article, we'll talk about where and how you can publish your Gruveo handle on your social media. Social media platforms are huge and you know it. Pretty much everybody is using at least one so why not take advantage of this! The first option is to include your @handle or, even better, your Gruveo call link in the description of your business on Facebook, Twitter, LinkedIn and Google+. These are the more traditional social media platforms, but no matter what you use, you can put your handle/call link into the About section. Your Gruveo call link in your About section on Facebook. This article continues where the previous one left off. 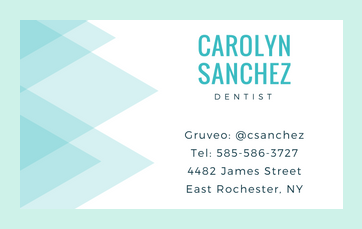 Another place your Gruveo handle should be presented is on your business card—for all the same reasons laid out in the last article about including your Gruveo handle in y﻿﻿﻿﻿our email signature. A Gruveo handle on a business card. We'd like to add one crucial psychological point that many professionals don't think about. But many business professionals still think about their email signature as a place for "traditional" contact information. If this sounds like you, you probably keep your Gruveo handle as a secret "weapon" for cases when call recordin﻿﻿﻿﻿﻿﻿g or screen sharing is needed. And for all your other "normal" calls, you'll use your phone number. 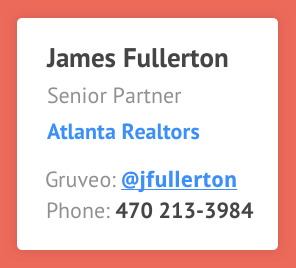 An email signature with a Gruveo handle linkified with a Gruveo call link that will start a call when clicked on. If you run a WordPress website, you'll be very excited to learn that supercharging it with a Gruveo call button is now easier than ever. With our new Gruveo Call Button plugin, adding the button to your WordPress site is now a simple matter of a couple of clicks — no HTML copying and pasting required! With a Gruveo call button, your website visitors call you on your Gruveo handle with voice and video without having to leave your site. Callers don't need their own accounts, and the service works in all major browsers without installs. An example of how the Gruveo call button and the popup window look on a website. One of the most useful features Gruveo offers is undoubtedly the Gruveo handle (also known as a direct Gruveo code)—a registered Gruveo call room that's unique to you and works like a phone number, but more awesome. If you don't have your handle yet, go register one now! They're completely free. If you've registered a Gruveo handle for your business, you've probably done so to make yourself more reachable to your clients, business partners and other parties. But for them to call you on Gruveo, you need to let them know that you have a handle in the first place, right? There are many creative ways to let the world know about your Gruveo handle so let's take a more detailed look at them. As the title suggests, in this article we'll talk about having your Gruveo handle on your website. Dear developers, we want to remind you that our Embed API is graduating from Beta on August 14, 2017. If you have been using the Gruveo Embed API since its early beta days and you only have an API secret without a corresponding client ID, you need to take action now! First, you need to contact our Sales﻿ team as soon as possible. They will provide you with a client ID and a new API secret that will ensure your continued access to the API. Second, you will need to update your code to use the current API authentication scheme. Please see Accessing Extended Mode in the developer documentation for details. Please make sure to request your API client ID to be able to use the Embed API beyond August 14, 2017. If you are a Gruveo user, you already know this. Here at Gruveo, we like it easy. We also believe that Gruveo can make all your business and personal communications easy while taking them to the next level. To enjoy all the benefits Gruveo offers, you need to give it a fair chance to prove itself to you. This means you should use Gruveo for your everyday communication with clients, business partners, colleagues...everybody. Gruveo is already covering all the business and personal conversations of so many business professionals, making their day-to-day business life easier and more efficient, and it can do the same for you. You might be curious about how to do this. 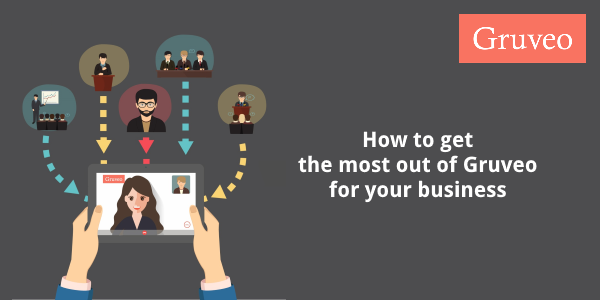 Just how do you start using Gruveo for all your communications and get other people to use it to contact you? To help you out, we have decided to create a series of articles called Gruveo for Business. Yet more fantastic news for developers! We have just released the Gruveo SDK for Android and we want you to check it out. 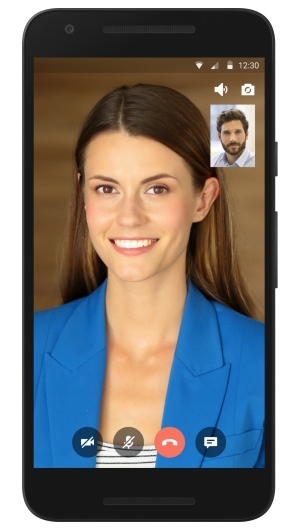 Gruveo SDK for Android lets you quickly add a video chat screen to your app. The SDK lets you add a video chat screen to your app and communicate with it using a simple API. The screen comes with all user-facing controls already in place and is the quickest way to add video and voice chat to your Android app. ​Not that long ago, we released the Favorites feature for our Android ap﻿﻿﻿p, leaving the Gruveo for iOS app users a bit sad...but not for long. The Gruveo for iOS app now has the Favorites feature, too. And ​it’s also got the Recents feature! The Recents feature shows you the whole call history—all incoming and outgoing calls. For each call, you can see the date and time of the call, the call room name or handle called, whether it was an incoming or outgoing call and how many Gruveo video or voice calls you have had using that particular call room/handle.